Evenett, S and J Fritz (2017), Will Awe Trump Rule? The 21st Global Trade Alert Report, CEPR Press. Keck, A, and A Lendle (2015), “New Evidence on Preference Utilization”, WTO Staff Working Paper ERSD-2012-12. Keynes, S, and C Bown (2018), “Trump, China, and Tariffs: $3 billion, $50 billion, or $100 billion?” Trade Talks Episode 32. 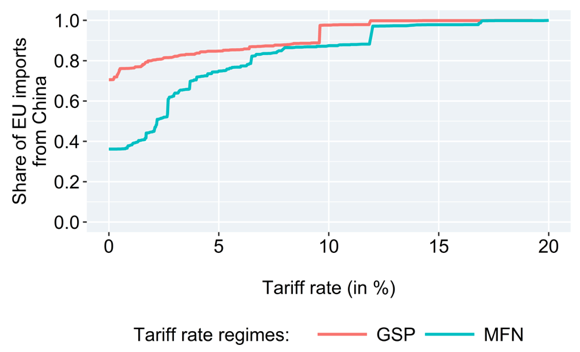 Nilsson, L (2011), “Small Trade Flows and Preference Utilisation: The Case of the European Union”, South African Journal of Economics 79(4): 392-410. On 20 November 2012, the EU’s GSP reform came into force. It reduced the number of GSP beneficiaries to about 80 countries, while expanding the number of affected tariff lines (regulation 978/2012). Shortly after, the Commission announced regulation 1213/2012 in which it reduced the number of country-specific sectors eligible for GSP. China was the country mostly affected by these changes coming into force on 1 January 2014. Finally, China was fully removed from the list of GSP-eligible countries by regulation 1421/2013 on 1 January 2015. We exclude tariff lines (i.e. 6-digit HS codes) for which duties are not ad-valorem. 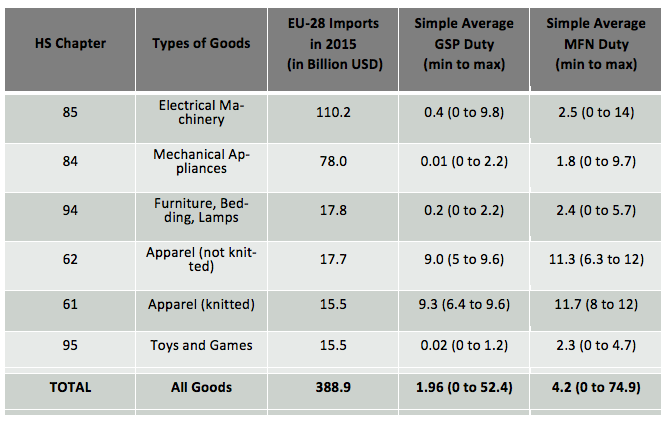 This constitutes 136 commodities which account for less than 1 percent of all EU imports from China. Data from the World Bank on Customs and other import duties (% of tax revenue) to be found here. 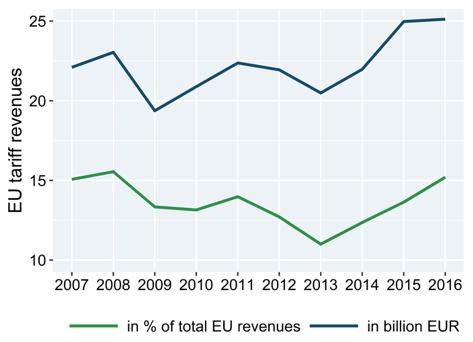 The Official Journal of the European Union, published on June 6, 2014 states that "Member States are to retain, by way of collection costs, 20 % of the amounts collected by them". It can be found here.